Join us Sunday, December 2, noon to 5 pm in downtown Covington for the second annual St. Tammany’s Holiday Festival of Arts. Five hours. Two blocks. And something for everyone on your list. It’s a great opportunity for holiday shopping, and it’s taking place in the 300 and 400 blocks of N. Columbia Street. It’s the second annual St. Tammany’s Holiday Festival of Arts, a celebration of local up and coming and seasoned artists, authors, performing artists and more. With a broad spectum of visual and literary artists, plus live entertainment by THE TOPCATS and Christian Serpas and Ghost Town duo, this promises to be the most fun you can have picking out special gifts for everyone on your list. We are honored that #ShopLocalArtistsWeek has been embraced by Americans for the Arts as a national event, broadening the conversations and support of local artists to a nationwide celebration. This event is presented by Northshore Cultural Economy Coalition, St. Tammany’s Holiday Festival of Arts and Shop Local Artists Week – Louisiana are supported by a grant from the Louisiana Division of the Arts, Louisiana Office of Cultural Development in cooperation with the Louisiana State Arts Council, as administered by the St. Tammany Parish Commission on Cultural Affairs. Funding has also been provided by the National Endowment for the Arts/ArtWorks. Special thanks to our event sponsors, EDGE of the Lake Magazine, Slidell Magazine and Bourgeois Bennett, CPAs & Consultants – Northshore. Thanks also to the City of Covington – Office of Cultural Arts & Events for their support of this event. City of Mandeville’s Annual Winter on the Water close out an entire day of festivities kicking off he holiday season in Old Mandeville. Join us for an evening of fun for the entire family beginning at 4:00 p.m. with the Santa Parade, Lighting of the Oaks by Mayor Villere, Lighted Boat Parade, live music at the gazebo featuring Fadra White, Zondra Jones & Wynton Pennington of Soul Revival, facepainting, Mandeville Elementary School’s Bell Ensemble, pictures with Santa and so much more! Join us December 3, noon to 5 pm in downtown Covington for St. Tammany’s Holiday Festival of Arts. Five hours. Two blocks. And something for everyone on your list. It’s a great opportunity for holiday shopping, and it’s taking place in the 300 and 400 blocks of N. Columbia Street. The event will include more than 50 booths featuring local artists and arts organizations with offerings in a variety of media including paintings, etchings, pottery, sculpture, photography, jewelry and hand-made accessories. In the new Art Alley, located in the 300 block of N Columbia St., a Holiday Reflections Children’s Tea hosted by The English Tea Room will feature storytelling, musical performances, theatrical characters and visits with Santa from 1 to 3 pm. Tickets to the event are $35, and are available via The English Tea Room, (985) 898-3988. Louisiana Seafood cooking demonstrations will be offered by Meribo Chef Gavin Jobe and Old School Eats Chef Christopher Case. The dishes that the chefs demonstrate also will be available for purchase. Live entertainment will include music by Redline and Christian Serpas & Ghost Town Duo, and literary readings, tale telling and book signings by local authors will be offered from noon to 4 pm at St. John’s Coffee House. An opportunity to show love for our local military troops serving overseas will be offered by Slidell Ladies for Liberty, who will host a holiday card-making station, and Bayou Wood Turners, creating hand-turned wooden Freedom Pens to be gifted to active duty military. 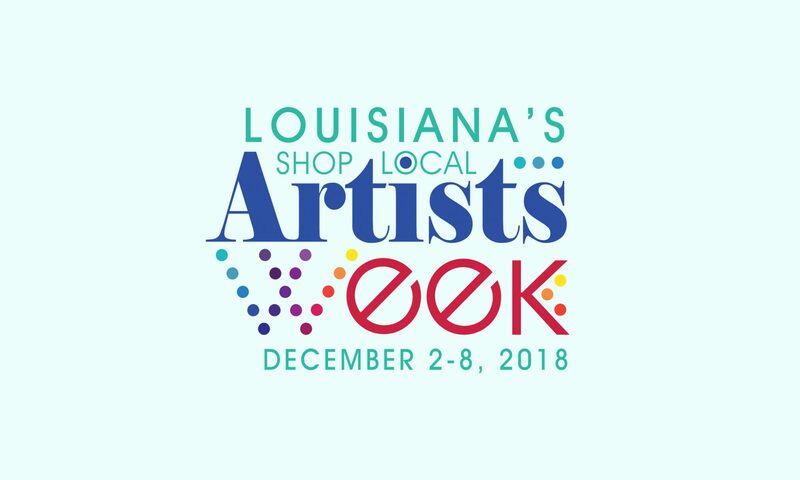 St. Tammany’s Holiday Festival of Art is presented by Northshore Cultural Economy Coalition, working in partnership with the Cities of Covington, Mandeville and Slidell, and St. Tammany Art Association. Event sponsors include Louisiana Seafood Promotion & Marketing Board, Edge of the Lake Magazine, Slidell Magazine, and The English Tea Room. The event is funded in part by a grant from the Louisiana Division of the Arts as administered by the St. Tammany Commission on Cultural Affairs. Admission is free. For more information and a complete listing of the week’s events, visit www.ShopLocalArtistsWeek.com. Founded in 2009, the mission of Northshore Cultural Economy Coalition is to facilitate growth, development and increased awareness of the cultural economy and its impact by focusing on coalition building, public policy, business support, outreach, advocacy and arts education. Membership is free and open to all cultural economy workers, organizations and businesses. This Shop Local Artists Week event is supported by a grant from the Louisiana Division of the Arts, Office of Cultural Development, Department of Culture, Recreation and Tourism, in cooperation with the Louisiana State Arts Council, and as administered by the St. Tammany Commission on Cultural Affairs, St. Tammany Parish Government. Funding has also been provided by the National Endowment for the Arts, Art Works. Join us as we celebrate Old Mandeville’s favorite Holiday Tradition! Our 13th Annual Christmas Past Festival will be held on Saturday, December 9th from 9:00am-3:00pm. The festival will begin at the Mandeville Trailhead and work its way down Girod Street towards Lakeshore Drive. The streets are lined with art, crafts and food vendors, etc. Special music performance featuring Amanda Shaw at 12:30, facepainting, Games, Superheroes, Disney Characters, Irish Dancing, Northshore Roller Derby, and so much more!